Having worked for Harvey Ingram for over five years, we were very excited for them when they merged with Shakespeares making them the second largest law firm in the Midlands. 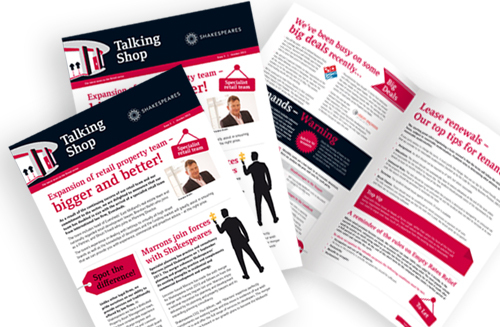 We have recently completed the latest edition of ‘Talking Shop’ – the retail newsletter going out to all their retail clients and target clients. With the merger complete, this edition needed to take on the Shakespeares’ brand. It needed to be bold and confident and follow a new set of guidelines – cementing Shakespeares’ retail expertise. It also needed to reassure clients of Harvey Ingram that the same team is in place and has expanded with major new hires.